Minimum System Requirements are the very minimum specs that your computer needs to run the software. If you try to use the program when your computer does not meet the minimum system requirements, you will experience a wide array of unpredictable results. over 70 types of cargos. 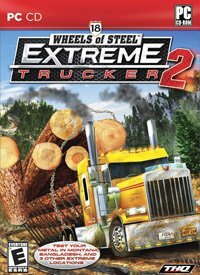 Like its predecessors 18 Wheels of Steel Extreme Trucker, this truck game was developed by the Czech company SCS Software ® and was published by Valusoft ® in the beginning 2011 year. There are actually two different locations: Montana and Bangladesh apart from Alaska, Australia, and South America good known from the first part of Extreme Trucker. 18 Wheels of Steel Extreme Trucker is missions-oriented trucking game with new elements built in. It drops the "tycoon" side of the management gameplay completely. Instead, it is offering "special experiences" - driving in extreme environments. This is the kind of territories that would not be possible to integrate into normal 18 Wheels of Steel series which are always centered around the US. So the game will tentatively include driving in far-north icy region (somewhat inspired by Ice Road Truckers), and there will also be driving in Southern American jungle environment, and in Australia with some road trains for a bit of fun. All of these real world locations are extremely beautiful and extremely harsh at the same time. So, the aim of this game is to deliver goods around the whole worlds, to build your reputation and be real "hard trucker". You will start your adventure in one of available location as a complete newbie, and later as you progress through the game, you will get the chance to transport more demanding and even intimidating cargoes over longer distances, and often in severe weather conditions. When you gain enough experience you get a chance for new jobs in other location like Australian Outback, Tuktoyaktuk Winter Road, Yungas Road, Montana and Bangladesh. You will be able to travel between these locations freely. However, you will start as a beginner in each region and you will have to work your way up through the ranks to become the most respected driver with the most intriguing offers. These level up limit are valid for basic Extreme Truck game only. The patches can (but not must) have influence on described limit here). © Copyright TruckPol 2001-2019. All rights reserved.